Are you looking for Peek Screws? PEEK screws are used widely, even in the most extreme applications. PEEK, an acronym for PolyEtherEtherKetone, offers a unique combination of properties including excellent mechanical and chemical resistance, high tensile strength, excellent electrical properties, and much more. It’s even lightweight, so it can be used in applications like medical implants. 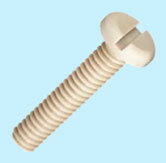 A standard PEEK screw includes no fillers, so it an unreinforced and 100% polymer. Includes semi-crystalline granules for injection molding and extrusion, and is FDA food contact compliant. The color is “natural”, which looks beige. Applications for higher strength and stiffness, as well as high ductility. Chemically resistant to aggressive environments, suitable for sterilization for medical and food contact applications. It’s like the unreinforced PEEK screw, with all its chemical resistance, except its 30% glass fiber reinforcement nearly doubles the tensile strength of the standard unfilled PEEK screw. Applications that require a higher strength in a static system, those that need low coefficient of thermal expansion. It’s also a choice for applications that need chemical resistance to aggressive environments, such as sterilization for medical/healthcare, and food contact applications. Need custom or other PEEK screw grades? Contact us - we can help!